As the Allied plan of operations called for the build-up at top speed in Australia of a strong U.S. air force to strike at the enemy from forward bases in Java, USAFIA became in effect a supply echelon of ABDACOM, charged primarily with the logistical support of U.S. air operations in Java. United States aircraft and supplies would be rushed to Australia by way of the newly opened South Pacific ferry route whose island bases--Hawaii, Christmas Island, Canton Island, Samoa, Fiji, and New Caledonia--formed steppingstones all the way from the west coast of the United States to the east coast of Australia. Upon arrival the planes and matériel would be assigned to General Wavell for defense of the Barrier.4 The Australians were left to defend the island continent's eastern and northeastern approaches as best they could using their own resources, the assumption at the time being that Australia was safe as long as the Barrier held. The trouble was that Australia was, if anything, even more exposed from the northeast than from the northwest. What was more, it had heavy obligations there, being responsible for the defense of territories in New Guinea, the Bismarck Archipelago, and the Solomon Islands. Its two territories in New Guinea--Papua, a territory of the Commonwealth, and North East New Guinea, a part of its New Guinea Mandate--together made up the eastern half of that immense island, the rest being controlled by the Dutch. Its mandated territory also included New Britain and New Ireland in the Bismarck Archipelago and Buka and Bougainville in the northern Solomons. It was, in addition, responsible for the defense of the British, or southern, Solomons, the whole New Guinea-Bismarcks-Solomons defense zone being known as the Northeast Area. The means available to the Australians for the defense of this vast area and of Australia itself were very limited. By late 1941 Australia, a country of only a little over seven million people, had already been at war for more than two years. Loyally joining the mother country in the fight against the European Axis, the Australians had dispersed their land, sea, and air strength around the world. When the Japanese struck, nine squadrons of the Royal Australian Air Force (RAAF) were serving with the British in the United Kingdom, the Middle East, and Malaya. Some 8,800 Australians were with the Royal Air Force (RAF). Major units of the Royal Australian Navy (RAN), which then consisted principally of two heavy and three light cruisers, had just reached home waters after months of service with the Royal Navy in the Mediterranean Sea and Indian Ocean. The ground forces were not much better off. Except for training cadres and an Australian Imperial Forces armored division without tanks, there were virtually no trained soldiers left in Australia. The bulk of those at hand were militia troops who would need months of training before they would be ready for combat. Forces (CMF), the conscripted home defense force then liable for service only in Australia and Papua. The AMF was poorly armed. It was deficient in field equipment and, until February 1942, when the full mobilization of the CMF was finally completed, did not have even its minimum quota of small arms. It was organized into seven militia divisions, but these were at best only training units, which had just begun to train their personnel on a full-time basis. It had been planned to keep the militia force at a constant strength of 250,000 men, but during 1941 only half that number had been in the training camps at any one time. The basis of call, three months in camp and three months at home, had insured that Australia's overtaxed war industry would not be robbed of men it could ill afford to lose, but it had not done much to further the training of the troops, most of whom were scarcely beyond the recruit stage when full-time training began. The Australian Chiefs of Staff, the staff officers charged with the security of Australia, were faced with the problem of how best to use their inadequate forces in its defense. To begin with, they had to decide whether to make the principal defense effort in Australia or on its periphery, in the Northeast Area. on the mainland, the assumption being that as matters stood there was no choice but to make the fight for Australia in Australia itself. Also stationed at strategic points in the Northeast Area was a small band of picked observers known as the Coast Watchers. Usually long-time residents of the area which they were to keep under surveillance, they had the duty of remaining behind when the Japanese came and reporting on their movements by radio.14 The Coast Watchers, who had long prepared themselves for the task, did not have long to wait. By the end of December, the Japanese had thoroughly reconnoitered the Bismarck Archipelago and the Lae-Salamaua area. Beginning on 4 January, four-engine flying boats and carrier aircraft bombed Rabaul repeatedly, forcing the Hudsons to withdraw to Australia. On 20 January all the Wirraways were shot down in a raid by one hundred carrier planes. A day later carrier based dive bombers literally blasted both coastal guns out of the ground.15 The stage was set for the conquest of Rabaul. as possible with the capture of Rabaul. The commander in chief of the 4th Fleet, Vice Adm. Shigeyoshi Inouye, was ordered to support General Horii in the Rabaul operation and, simultaneously with the capture of Rabaul, to use his naval troops to take Kavieng. On 8 January (after having in the meantime flown to Truk and concluded an agreement with Admiral Inouye as to the fleet's part in the operation), General Horii issued orders for the capture of Rabaul. D Day was to be 23 January, and the landings were to begin at approximately 0100. The main body of the invasion convoy arrived off Rabaul on the night of 22-23 January and, a few minutes after midnight, began landing at Karavia and Simpson Harbor. Landings at Raluana Point and Vulcan Island followed. The Australians, who had only mortars, machine guns, and rifles, resisted stoutly from prepared positions and, though almost completely surrounded, continued to fight through the night and early morning. By 1000 the situation was seen to be hopeless, and the order was given to withdraw. Some of the Australian troops held their positions and fought to the death; the rest took to the hills with Japanese patrols in pursuit. Many of the fleeing Australians were caught and massacred, but four hundred of them managed to elude the Japanese and, after a harrowing march that tested their every ounce of endurance, reached the south and north coasts of New Britain more dead than alive. There other Australians, who had reached the scene from New Guinea, searched them out and took them to safety in small boats.19 With the fall of Rabaul, the forward defense of the Northeast Area crumbled. All that was left of it was the garrison at Port Moresby, the troops in the Bulolo Valley, and a handful of commandos in the Admiralties and the Solomons who were prepared to leave or "go bush" at a moment's notice. bound into North East New Guinea and the Solomons. Port Moresby and the Allied communications line to Australia, three of whose main bases--New Caledonia, Fiji, and Samoa--were within striking distance of the southern Solomons, were in danger. But if Port Moresby now had a modicum of protection from the sea, its garrison continued as before without fighter planes. The direction from the Combined Chiefs to the contrary, General Wavell was able neither to provide it with aircraft nor to take over its defense.22 Indeed, so badly had things gone in Wavell's area that he soon found himself unable to hold the Barrier with the means at hand. The Barrier was now completely breached. With no further reason for being, ABDACOM was dissolved on 25 February. General Wavell returned at once to India, and General Brett to Australia, where each resumed his former command.27 The defense of Java fell to the Dutch, who, disregarding the odds, chose to fight on, though the struggle by this time was clearly hopeless and the early fall of the island was a foregone conclusion. tenuous of communications and, by the only available road, was more than a thousand miles from Australia's developed and inhabited areas on the other side of the continent. Even though the Japanese could, if they wished, take Darwin, it was clear that they would have to think long and carefully before they undertook operations in Australia's parched and inhospitable Northern Territory. The landings were preceded by heavy air attacks on Lae, Salamaua, Wau, Bulolo, and Port Moresby, beginning 2 March. The invasion convoy of three cruisers, eight destroyers, a seaplane tender, and several transports and cargo ships left Rabaul on the night of 5 March and made for New Guinea along the south coast of New Britain. On 9 March, the day that the Java garrison finally surrendered,33 a flight of ANZAC B-17's from Townsville tried to prevent the Japanese from consolidating their newly won positions on the Huon Gulf. The attack was unsuccessful, but the enemy landing forces were not to go unscathed. After the abortive attempt of the Lexington to raid Rabaul in late February, a larger carrier force, comprising the Lexington and Yorktown, supported by eight heavy cruisers and fourteen destroyers, including cruisers and destroyers from ANZAC Force, was assembled in early March to complete the mission. The Japanese landings, which the carrier forces might have prevented had they struck earlier, caused an immediate change in plan. On 10 March 104 carrier planes took off from the Lexington and the Yorktown, which were then in the Gulf of Papua, flew through a pass in the Owen Stanley Mountains, and struck at enemy concentrations on the Huon Gulf. Though he did not know it at the time, General Rowell had guessed the enemy's intent exactly. In the orders of 2 February for the landings at Lae and Salamaua, Imperial General Headquarters had spoken of moves against Port Moresby and Tulagi but had issued no specific orders pertaining to those operations. On 9 March the 4th Fleet, in a companion move to the landings on the Huon Gulf, sent a landing party to Buka, in the northern Solomons;39 on the 15th the Army and Navy Sections of Imperial General Headquarters met to decide on some definitive line of action with regard to Australia. The plan said nothing about invading Australia; it did not have to. If everything went well and all objectives were taken, there would be time enough to begin planning for the invasion of the Australian mainland. Meanwhile, it would be possible to squeeze Australia and render it harmless without invasion and at much less cost. It was clear from the circumstances that the Japanese had not given up the idea of invading Australia. They had merely laid it aside in favor of measures that, if successful, would make invasion--in the event they found it necessary later on--a comparatively easy matter. The immediate object was to isolate Australia, and the plan for doing so was ready to go into effect. Japanese naval aviation was now within 170 air miles of Port Moresby, close fighter distance. The 4th Fleet was spreading rapidly through the northern Solomons, with the southern Solomons next. 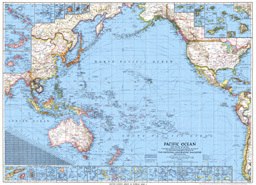 The final step, after Port Moresby was taken, would be to seize New Caledonia, Fiji, and Samoa, thereby severing the line of communications between the United States and Australia. The Japanese had already taken Singapore and the Indies and, with General MacArthur's main force hopeless and starving on Bataan, would soon complete the reduction of the Philippines. Their success thus far had been astounding, and now after only three months of operations they were threatening Australia, the last major position still left to the Allies in the southwest Pacific. The danger to the Commonwealth was immediate. If it was to be organized as a base for Allied offensive operations, it could not be permitted to succumb to the Japanese, whatever their designs upon it. The Allied high command, seeing the danger, already had under consideration measures that sought both to strengthen Australia's defense and to organize it for future offensive action. 1. Despatch by the Supreme Commander of the ABDA Area to the Combined Chiefs of Staff (London, 1948); Gavin Long, Australia in the Second World War, Part Seven, Ch. XXVII, pp. 389-95, in C. Hartley Grattan, ed., Australia (Berkeley, 1947); Winston S. Churchill, The Hinge of Fate (Boston, 1950), p. 14. 2. Msg, CG AAF to Gen Brett, No. 59, 2 Jan 42 copy in AG 381 (1-1-42) Misc, DRB HRS; AGO Msg, Gen Brett to Gen George C. Marshall, No. CR 0139, CM-IN 30, 23 Jan 42; Maj Gen Julian F Barnes, Rpt of Orgn and Activities USAFIA copy in OCMH files. The command had been established on 22 December as the United States Forces in Australia (USFIA) upon the arrival at Brisbane of the Pensacola convoy, a 4,600-man movement of air corps and field artillery troops originally destined for Manila and diverted to Australia upon the outbreak of hostilities with Japan. General Brett, a noted air corps officer, and then a major general, reached Australia by air from Chungking on 31 December and took command, becoming commander of United States Army Forces in Australia (USAFIA) when USFIA took that name on 5 January. For a full account of the contemporary operations of the United States Army Forces in the Far East (USAFFE), General MacArthur's command in the Philippines, and of the blockade-running activity, see Louis Morton, The Fall of the Philippines, UNITED STATES ARMY IN WORLD WAR II (Washington, 1953). 3. CCS Dir to Supreme Comdr ABDA Area, 2 Jan 42, copy in ABDACOM Msg File, OPD Exec File. 4. Msg, Gen Brett to Gen Marshall, No. CR 0139, CM-IN 30, 23 Jan 42; Msgs, Gen Marshall to Gen MacArthur, No. 879, 24 Dec 42, No. 885, 26 Dec 41, in AG 381 (12-25-41), Sec I; Msg, Gen Marshall to Gen Brett, No. 41, 25 Dec 41, in same file; Msg, Marshall to Brett, No. 25, 16 Jan 42, in WPD 4639-19; Memo, Brig Gen Leonard T. Gerow, ACofS, for Gen Marshall, 27 Jan 42, sub: Messages from Australia, in WPD 4628-24. 5. Msg, Prime Minister of Australia to Prime Minister of United Kingdom, 21 Feb 42, in OPD Exec Off File, Bk 4; WD, Survey of Australia, 25 Feb 42, pp. 95-97, copy in OCMH files; Rpt on Australia for the CinC Allied Forces, 14 Mar 42, in G-3 Jnl GHQ SWPA; Long, Australia in the Second World War, pp. 391, 396; Churchill, The Hinge of Fate, p. 10. 6. AAF, The Army Air Forces in the War Against Japan, 1941-1942 (Washington, 1945), p. 62; USSBS, The Campaigns of the Pacific War (Washington, 1946), p. 53; E. Roland Walker, The Australian Economy in War and Reconstruction (New York, 1947), p. 57. 7. Memo, Brig Gen Raymond E. Lee for ACofS WPD, 9 Jan 42, in SWPA MacArthur File, OPD Exec File; Ltr, Gavin Long, Official War Historian, Australia, to Maj Gen Orlando Ward, Chief of Military History, USA, 7 Mar 51, in OCMH files; WD, Survey of Australia, pp. 95-100; Long, Australia in the Second World War, pp. 395-97. 8. Memo, Lt Gen V. A. H. Sturdee, CGS AMF,and Lt Gen Sydney F. Rowell, VCGS AMF, for author, 16 Dec 47, in OCMH files. Generals Sturdee and Rowell, respectively Chief and Deputy Chief of the General Staff, AMF, in December 1941, and the last remaining members of the Chief of Staff organization of that day to be still serving in 1947, graciously wrote this memorandum for the author to present the point of view of the Australian Chiefs of Staff during the opening months of the war. 9. Rpt on Australia for CinC Allied Forces, 14 Mar 42; WD, Survey of Australia, p. 96. 10. Rpt on Australia for CinC Allied Forces, 14 Mar 42; OCE SWPA, Draft Engr Rpt 1942, 31 Dec 42, in AFPAC Engr File; Memo, Long for Hist Div, SSUSA, n. d. Jan 48, sub: Answers to Questions by the Historical Division, in OCMH files; George H. Johnson, The Toughest Fighting in the World (New York, 1943), pp. 15, 43, 45; Osmar White, Green Armor (New York, 1945), pp. 43, 44, 52. 11. Memo, Long for Hist Div, SSUSA, n. d. Jan 48; Australian Military Forces, The Battle of Wau (Canberra, 1943), passim; White, Green Armor, pp. 89-148. 12. Rpt on Australia for CinC Allied Forces, 14 Mar 42; USSBS, The Allied Campaign Against Rabaul (Washington, 1946), p. 6; Comdr Eric A. Feldt, RAN, The Coast Watchers (Melbourne 1947), p. 39; Johnson, The Toughest Fighting in the World, p. 28; White, Green Armor, pp. 32-33. The prefix "2/" in front of the 22 in 2/22 Battalion indicates that this was the second time that the 22d Battalion was constituted an AIF unit. 13. Rpt on Australia for CinC Allied Forces, 14 Mar 42, Memo, G-3 SWPA for CofS SWPA, 19 Sep 42, sub: Australian Independent Companies, in G-3 Jnl, GHQ SWPA; Memo, Long for Hist Div, SSUSA, n. d. Jan 48; Feldt, The Coast Watchers, pp. 31, 35, 47, 53. 14. Feldt, The Coast Watchers, passim. 15. Statement, Lt Col H. H. Carr, CO 2/22 Bn, AIF, 13 Jun 42, in Allied Geographic Section, Terrain Study No. 22, Area Study of Gazelle Peninsula and Rabaul, App A-1 , pp. 50, 51; USSBS, The Allied Campaign Against Rabaul, p. 6; Feldt, The Coast Watchers, pp. 39-42; White, Green Armor, pp. 33-34. 16. 1st Demob Bur, Hist Sec G-2, GHQ FEC, South Seas Det Opns 1941-42, Japanese Studies in World War II, No. 55, pp. 1-3; 1st Demob Bur, Hist Sec G-2, GHQ FEC, Central Pacific Opns I, Japanese Studies in World War II, No. 36, pp. 1, 2. Both in OCMH files. SEATIC, Hist Bul No. 243, Hist of the Japanese 28th Army, 1 Oct 46; ATIS SWPA, Biographical Sketch, Gen Tomitaro Horii, 27 Aug 42. Both in ACofS G-2 WDGS Files. 17. Walton L. Robinson, "AKAGI, Famous Japanese Carrier," in United States Naval Institute Proceedings, May 1948, p. 581; South Seas Det Opns, pp. 3, 5, 6; 1st Demob Bur, Hist Sec G-2, GHQ FEC, South Seas Det Opns, 2d ed., Japanese Studies in World War II, No. 109, pp. 4-6, in OCMH files; SEATIC, Hist 28th Army; USSBS, The Allied Campaign Against Rabaul, pp. 6, 83, 114; Samuel Eliot Morison, History of United States Naval Operations in World War II, Vol. III, The Rising Sun in the Pacific (Boston, 1948), pp. 259-60. 18. Msg, U. S. Mil Attache, Melbourne, to Gen Marshall, No. 46, CM-IN 53, 26 Jan 42; Feldt, The Coast Watchers, pp. 44-45. 19. Statement, Col Carr, 13 Jun 42; South Seas Det Opns, pp. 7, 8; South Seas Det Opns, 2d ed. pp. 6-8; USSBS, The Allied Campaign Against Rabaul, pp. 6, 83, 114; Feldt, The Coast Watchers, pp. 42-43, 54-65; White, Green Armor, pp. 32-42. 20. CCS 8, Inclusion of Port Darwin in the ABDA Area, 24 Jan 42; CCS 15, Institution of the ANZAC Area, 24 Jan 42. Both in ABC 323.31 (1-29-42), Sec 1a. Msg, CCS to ABDACOM, No. 1231, CM-IN 25, 29 Jan 42. 21. Msg, Gen Marshall to Gen Brett, No. 166, 20 Feb 42, copy in AG 381 (11-27-41), Sec 2c; Hist 19th Bomb Gp (H), 8 Dec 41-31 Dec 41; AAF, The AAF in Australia to the Summer of 1942. Both in USAF Hist Off. Morison, The Rising Sun in the Pacific, p. 261. 22. Msg, Gen Wavell to CCS, ABDA No. 00647, 1 Feb 42; Msg, CCS to Gen Marshall, DBA No. 8, 3 Feb 42. Both in ABDACOM Msg File, OPD Exec File. Msg, Gen Marshall to Gen Wavell, No. 85, CM-IN 18, 6 Feb 42; Msg, COMANZACFOR to COMINCH, n.n., CM-IN 96, 13 Feb 42. 23. Wesley F. Craven and James L. Cate, eds., The Army Air Forces in World War II: Vol. 1, Plans and Early Operations January 1939 to August 1942 (Chicago, 1948), p. 400; AAF, The AAF in the War Against Japan 1941-1942, pp. 52, 53, 57. 24. WD, The World at War (Washington, 1945) p. 123; Hugh Buggy, Pacific Victory (Meibourne, 1945), pp. 60, 61, 63; Churchill, The Hinge of Fate, p. 92. 25. WD, The World at War, p. 123; Buggy, Pacific Victory, pp. 51, 52, 111-16. 26. Memo, Australian Dept of External Affairs for the Minister, 30 Aug 42, sub: Summary Report on Portuguese Timor during the period December 1941 to June 1942, by Mr. David Ross, Australian Consul at Dili, who arrived in Darwin from Timor on 10 July 1942, copy in G-3 Jnl, GHQ SWPA; Buggy, Pacific Victory, pp. 51-59. 27. Msg, Gen Marshall to Gen MacArthur, No. 1083, 24 Feb 42; Msg, Gen Wavell to Gen MacArthur, No. 1088, 25 Feb 42. Both in AG 381, Sec 2c. Despatch Supreme Commander ABDA Area (London, 1948), p. 16; Gen Barnes, Rpt of Orgn and Activities, USAFIA. Upon General Brett's resumption of command, General Barnes, who since 25 January had served as Commanding General, USAFIA, became Deputy Commander. Col. Stephen J. Chamberlin, who had served as chief of staff under Barnes since the latter's assumption of command, continued as chief of staff under General Brett. Barnes, who had reached Australia on 22 December in the Pensacola convoy as a brigadier general, had also served briefly as commanding general of the predecessor command, USFIA. Colonel Chamberlin, who had reached Australia by air on 9 January directly from Washington, had for a time been its G-4. 28. South Seas Det Opns, pp. 8-9. 29. Army and Navy Agreement, 16 Feb 42, quoted in South Seas Det Opns, p. 9. 30. ONI, Early Raids in the Pacific Ocean, pp. 35, 38, 40, copy in OCMH files; South Seas Det Opns, pp. 9, 10. 31. South Seas Det Opns, pp. 10, 11; 1st Demob Bur, G-2 Hist Sec, GHQ FEC, Naval Account, Japanese Invasion Eastern New Guinea, Japanese Studies in World War II, No. 100, pp. 5-9; 1st Demob Bur, G-2 Hist Sec, GHQ FEC, 18th Army Opns, I, Japanese Studies in World War II, No. 41, p. 4; AMF, Interr of Lt Gen Hatazo Adachi, formerly CG 18th Army, and members of his staff, by O/C 5th Mil Hist Fld Team, AMF, Rabaul. All in OCMH files. ALF, History of the Lae-Salamaua Garrison (Japanese), 1 Apr 44, copy in DRB HRS, AGO. 32. Msgs Gen Brett to Gen Marshall, No. 511 CM-IN 106, 5 Mar 42, No. 582 CM-IN 9, 9 Mar 42; South Seas Det Opns, pp. 11, 12; 18th Army Opns, I, 4; Naval Account, Japanese Invasion Eastern New Guinea, pp. 6-8; ALF, History of the Lae-Salamaua Garrison (Japanese); AMF, Interr Gen Adachi et al. ; Feldt, The Coast Watchers, pp. 49, 52; Johnson, The Toughest Fighting in the World, pp. 44-45; White, Green Armor, pp. 64, 66-67. 33. The garrison included, in addition to some 5,500 Britishers and 2,500 Australians, the 541 officers and men of the 2d Battalion, 131st U. S. Field Artillery Regiment, who had reached Soerabaja in January. USAFIA Check List, 11 Jul 42, in G-3 Jnl, GHQ SWPA; Despatch by the Supreme Commander ABDA Area, p. 16. 34. Msg, Lt Gen Delos Emmons, CG Haw Dept, to Gen Marshall, No. 2740, CM-IN 26, 12 Mar 42; Ltr, Gen George C. Kenney to Gen Ward, 26 Feb 51, in OCMH files; South Seas Det Opns, pp. 11, 12; Naval Account, Japanese Invasion Eastern New Guinea, pp. 6-9; ALF, History of the Lae-Salamaua Garrison (Japanese); ONI, Early Raids in the Pacific Ocean, February 1 to March 10, 1942, pp. 57-68; Morison, The Rising Sun in the Pacific, p. 389. 35. South Seas Det Opns, pp. 11, 12; 18th Army Opns, I, 4; Naval Account, Japanese Invasion of Eastern New Guinea, pp. 7-9. 36. Msg, Gen Brett to Gen Marshall, No. 490, CM-IN 48, 4 Mar 42. 37. Ltr, Gen Rowell, DCGS AMF, to author, 16 May 49, in OCMH files. 38. Appreciation of the Australian Chiefs of Staff, 5 Mar 42, sub: Probable Immediate Japanese Moves in Proposed ANZAC Area, in G-3 Jnl, GHQ SWPA. 40. 1st Demob Bur, G-2 Hist Sec, GHQ FEC, Hist Rec Army Section Imperial General Headquarters, Japanese Studies in World War II, No. 72, pp. 48-50, 51. The following are to the same effect: South Seas Det Opns, pp. 12, 14; 18th Army Opns, I, 5, 7.